According to recent numbers, more than 90 percent of people who are treated in an emergency room have no medical history available. That’s where medical alert bracelets come in. They’re simple products, but they serve a big purpose. Designed to be an effective means of communicating important medical information when the wearer can’t communicate that info on their own, these bracelets are usually engraved with information like allergies, diseases, personal details and more. It’s a way to make sure anyone giving you medical attention can be immediately aware of your specific needs. If your doctor has recommended one or you’ve decided to start wearing one on your own, know this: a medical alert bracelet doesn’t just give you peace of mind, it can actually save your life. There are many different medical alert bracelets on the market today, so if you’re looking for one, it can get a little confusing trying to choose between them all. To make your search a little easier, here’s a look at the top three medical alert bracelets, with details on what makes each one so good. It’s worth noting that while the companies listed here have return policies, engraved items usually cannot be returned unless there’s a problem with the workmanship. So make sure you double check your information. The Road iD bracelet is pretty popular with the outdoors community (mostly people who cycle, hike and run), but it makes for a pretty effective medical alert bracelet too. Several different designs are available, including the nylon “sport” model, the silicone “elite” model and the “stretch” model made from elastic silicone. A variety of color bands is available, with black, yellow, red and blue offered in most models. All models have a stainless steel faceplate that can hold up to five lines of entirely customizable text. Engraving and shipping are fast, with a turnaround time for both less than three days from purchase. 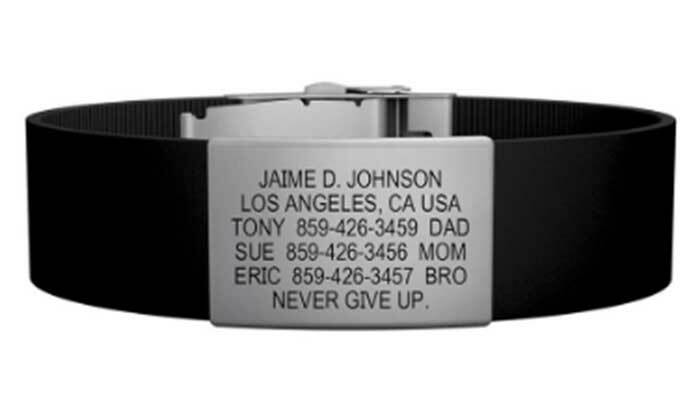 To make their bands a little more personal, Road iD bracelets have badges on the front that come in a number of fun designs, from branches of the military to sports to phrases like “Believe.” The faceplates are pretty affordable and easily interchangeable. Since they’re primarily designed for the sports community, if you choose a Road iD medical band, you know you’re getting a bracelet that will hold up to everyday wear. These bracelets can also be linked to an online profile with even more medical information available. You get six months of free online service when you purchase one, and the online profile is just $9.99 a month after that. Of course, the bracelet works just fine with no online extras. What do they cost? Most Road iD medical alert bands range in price from $19.99 to $29.99, with accessories like “badges” costing around $6 each. Road iD offers free shipping if you spend $50 or more. One other small benefit of Road iD is that every single purchase benefits a charity of your choice. Real customers are saying: Online reviews for the Road iD band show many of these being purchased for people with medical conditions. The bands consistently rate as very comfortable, with many users saying they don’t even notice they’re wearing it. It’s inconspicuous enough to be worn every day, but still clear in its purpose if you’re looking. 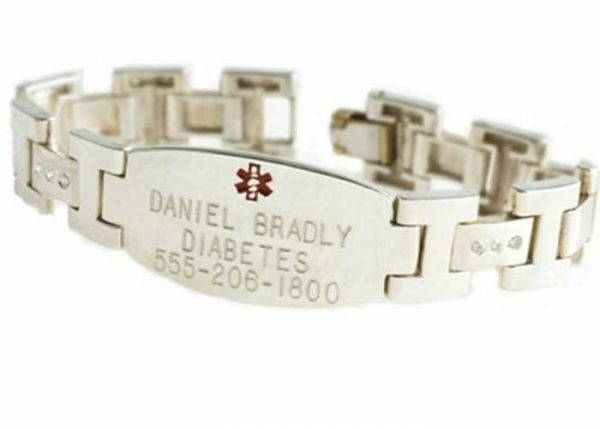 With over 20 years of experience in the industry, American Medical ID promises that their medical alert bracelets are some of the most affordable and best looking on the market. They offer designs specifically for men, women, and kids. The women’s and men’s designs look like any piece of jewelry from a store and can be sterling silver, casual material, titanium or gold. Kid’s designs come in fun colors and patterns like dinosaurs, space, butterflies and trains. 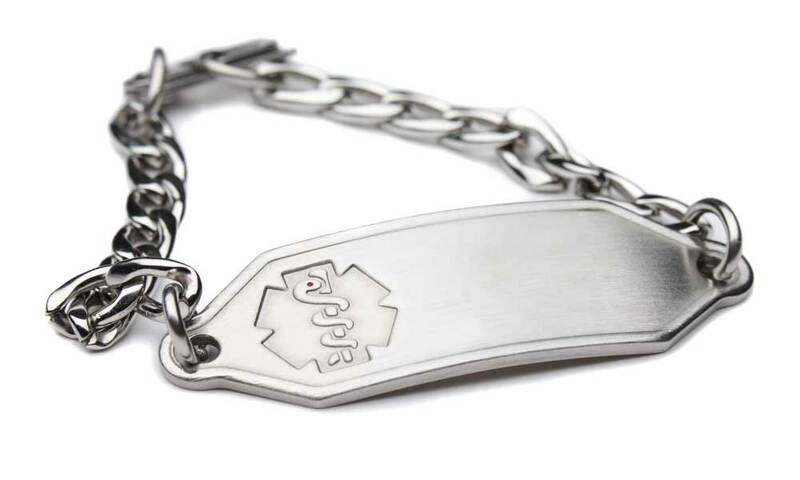 American Medical ID bracelets are all fairly fashionable and look like traditional jewelry, with only a small medical emblem to let responders know about the information they hold. They don’t offer customization in the way of changing the band once you have it, but you can choose from a small or large version of most bracelets to get the best fit for you, as well as chain color and length. What do they cost? A variety of bands are available, including stainless steel, sterling silver, 10 karat gold plated, solid 10 karat gold, and even 14 karat gold and titanium. Depending on the model you choose, prices range from right at $25 for a basic silicone band with stainless steel face to $80 or more for gold or titanium bands. Their “fashion” bands all seem to be right at $50. Engraving is an extra $7, which gives you four lines of text, with 16 characters on each line. Some bands offer front engraving as well for even more information at the same price. The company also offers an online “My Interactive Health Record” profile that has additional medical information. Real customers are saying: Taking a look at online reviews for American Medical ID, one thing is clear: customers often call their medical alert bands the prettiest they’ve found. Their bracelets look like a normal fashion accessory unless you’re specifically searching for a medical emblem on it (which first responders are trained to do). This company is, as the name implies, a way to get a medical alert bracelet that’s functional and fashionable. They offer probably the biggest variety in medical bracelets, including leather, stainless steel, titanium, beaded, yellow and white gold, silver, and even diamond. In short, if you want a medical bracelet that looks good, this is where you need to start searching. Beyond their traditional fashion line of medical bracelets, a line of “Design Your Own” bracelets is available, providing probably more options than any other company. They even have bracelets with QR codes, which pull up a full medical profile when scanned. Elegant Medical Alert’s bracelets usually have about three lines of text available for customization, with 16 characters on each line, so there’s enough space to provide important info, but perhaps a little less space than the other companies listed here. What do they cost? 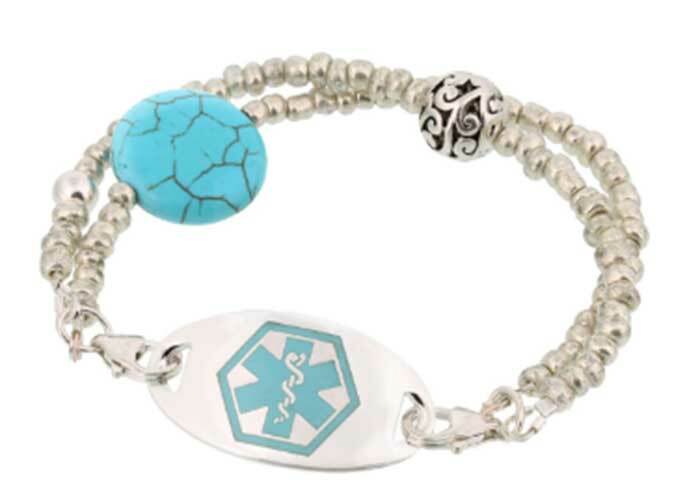 Due to the variety of medical alert bracelets offered, Elegant Medical Alert prices vary greatly, from upwards of $1,500 for the gold designs to under $20 for a simple, silicone bracelet. Real customers are saying: Customers consistently say that Elegant Medical Alert’s designs are the unique and least “medical” looking available. Their quality gets rave reviews, with people saying it’s comparable to any jewelry store. Why wear a medical alert bracelet? Medical professionals are trained to look at a patient’s neck or wrist for potential vital information, which means all the bracelets on this list are exactly what they’ll be looking for. There’s something appropriate for nearly any age and fashion taste, and many modern bands are virtually undetectable as medical alert bracelets unless you look very closely. Despite all the information as to how beneficial these bracelets are though, the vast majority of people who could benefit most don’t wear one. Thanks to new designs and more affordable technology (and considering how easily one of these bracelets could help save your life), there is a medical alert bracelet for every type of person.